A new decision-making model in which key decisions will require pre-scrutiny has been adopted at the Richmond Council meeting last week. Key decisions are those which are likely to result in significant expenditure or savings of over £500,000 or which is likely to be significantly affect communities living or working in two or more Wards. On Wednesday 16th May 2018 2nd Lieutenant Eric Henderson of the Post Office Rifles was finally laid to rest amongst his comrades on Messines Ridge in Belgium. He was the Great Uncle of Sarah Foot who lives in Newry Road in St Margarets and she saw him buried in Oak Dump Cemetery along with her two sisters Judith and Lucy. Unlock the secrets in your family tree this London History Day (May 31st) with a free workshop at Richmond Libraries. 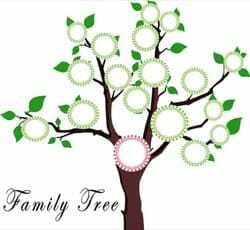 The ‘Family History for Beginners’ workshop will run from 2.30pm to 3.30pm in the Local Studies Search Room. 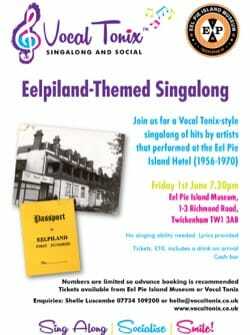 Join us for a Vocal Tonix-style singalong of hits by artists that performed at the Eel Pie Island Hotel (1956-1970). No singing ability needed. Lyrics provided. Have a go at something new with June’s ‘Festival of Learning’ programme. 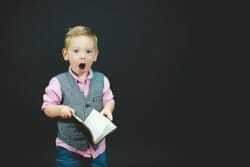 Love to learn? Have a go at something new at one of our libraries as part of the ‘Festival of Learning’ being held throughout June. Following the May Bank Holiday on Monday 28 May, Richmond Council will carry out waste and recycling collections (including Garden Waste Collections) for domestic properties one day later than usual. Residents will soon be able to have their say on plans to introduce a borough-wide 20MPH speed limit in Richmond upon Thames. The new, borough-wide 20MPH speed limit would replace the existing policy under which 20MPH zones are implemented on a road by road basis following petitions from residents. 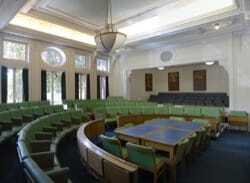 The petition is then evaluated by officers before a formal consultation begins. 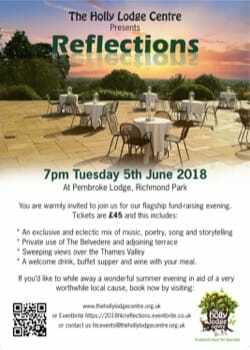 Discerning diners are warmly invited to a Summer evening of entertainment, in aid of The Holly Lodge Centre; a small but very hard-working local charity. Guests will enjoy exclusive use of the beautiful Belvedere suite and terrace and there will be poetry storytelling and music to suit every taste, from opera to boogie woogie.